So, I’ll hope you’ll forgive me as I shift from the topic of food for the day and tell you about my third StitchFix experience. I really enjoy reading about others’ StitchFix experiences, so I’m hoping you guys (er, maybe more so the girls, but hey, who knows), might at least find it semi-interesting as well. 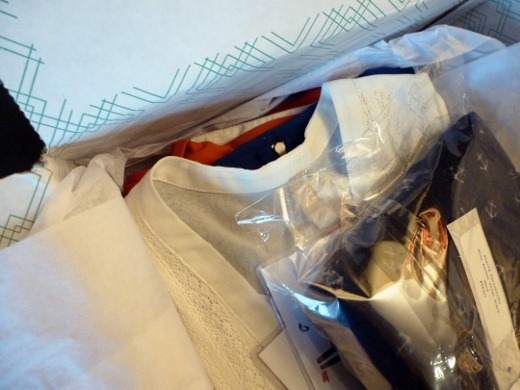 This was my third shipment, and I was a little nervous about the scarf and white top upon first opening my package. The first item I attempted to try on was the Costa Blanca Joel Size Zipper Capri Pant. While I absolutely love the style (skinny-fit!) 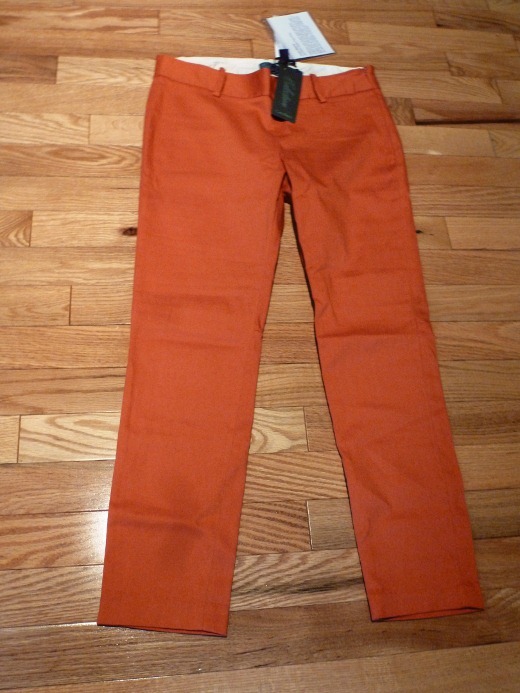 and bold color of these pants, unfortunately these were way too small and I couldn’t even pull them up around my waist. No problem, though because I actually already own some skinny jeans in a very similar color, and really don’t need a second pair of coral pants, anyway. Each fix typically includes one accessory and this time mine was a scarf. 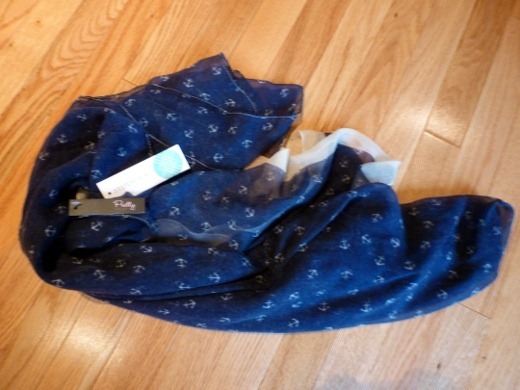 I’m not usually one to wear a scarf, so I wasn’t really drawn to this item, though I do find the mini anchor print to be adorable. My third item, I regret to say, was really just a big miss for me. 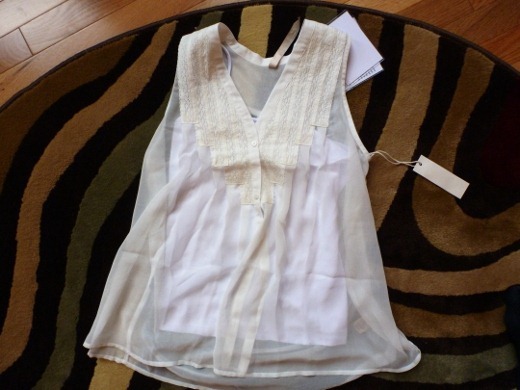 In my StitchFix style profile, I indicated that white is a color I’d prefer not to receive, and also indicated that I prefer fitted clothing over loose apparel. This flowy, shapeless, sheer white blouse was just really not me. 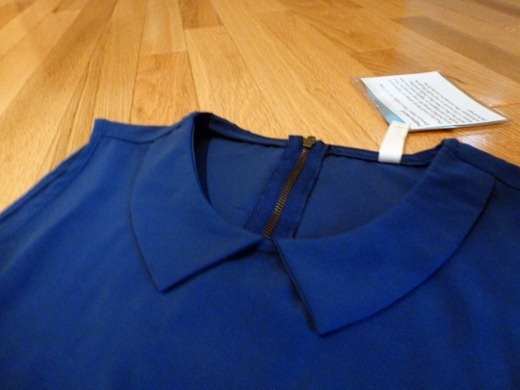 I did request a dress in this shipment and I believe my stylist took a few hints from my Pinterest account and noted that I am a fan of Peter Pan collars. I was immediately drawn most to this dress after looking through my box of items. 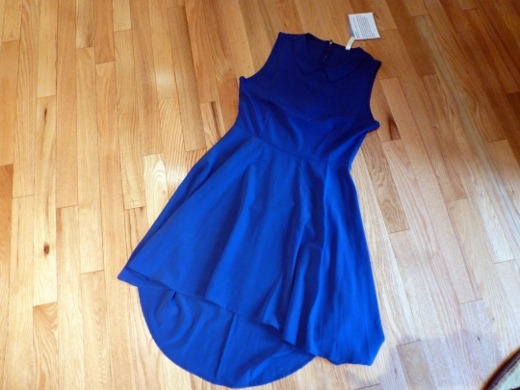 I simply adore this shade of blue, and love the fitted bodice paired with a flowy skirt. To style, I added a belt, tights, and black pumps. I really liked the way this dress fit, with one exception: it’s just a tad too lose in the armpit area which can make your undergarments visible. Basically, if I want to wear this dress and not have my bra visible from the side, I’d need to wear a jacket or cardigan with it. Fortunately for you, the undergarment view is not apparent in this front-facing photo! Another item I’d expressed a desire to see more of, was the pencil skirt. In the past I haven’t been a frequent wearer of skirts (probably because I owned none that fit), but my second StitchFix may have converted me, as I’ve worn the black pencil skirt purchased with Fix #2 several times already. 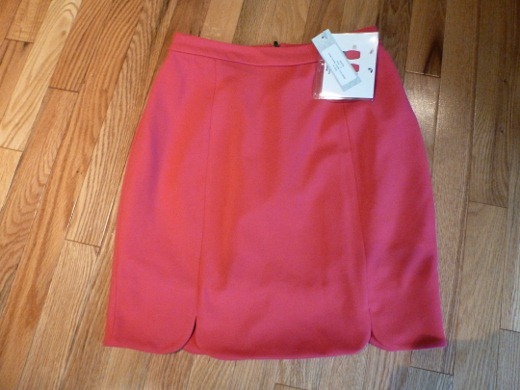 I paired this awesomely BRIGHT PINK pencil skirt with a white button up with black trim that I own and purchased at Express recently. My favorite element of this skirt is the scallop detail at the hem – so pretty. What I didn’t much care for was that the skirt was just a tad too tight around my waist. I also disliked that my tucked-in blouse was very visible, in the form of lumps and bumps, under the skirt. How does one remedy this? The lack of smoothness is not apparent in the below picture, but it definitely bugged me in real life. And that was my third fix! 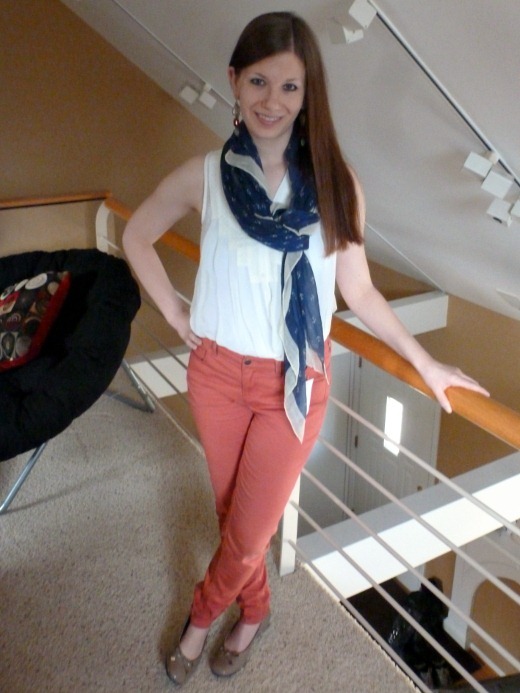 I did not keep the coral capri pants that didn’t fit around my waist! In my next post I’ll tell you which item I kept! Why thank you so much! 🙂 And you are correct! I hide the lumps and bumps of tucked in shirts by tucking them in to tights and/or full coverage underwear. That’s a good tip – thanks! I’ve actually never tried that but it makes so.much.sense!